As far as ductless air conditioners are concerned, it is considered as one of the less expensive HVAC methods to cool a home. Especially, in case of older homes where radiators are installed or have baseboard heating, ductless air conditioners are of great help. This is because homes which do not have ducts in such homes installing central air conditioners can be a costly affair whereas installation of ductless air conditioners can be quite simple. Besides installing ductless air conditioners can save you from the hassles of installing a window air conditioner which one has to remove from the window when the system is not in use. 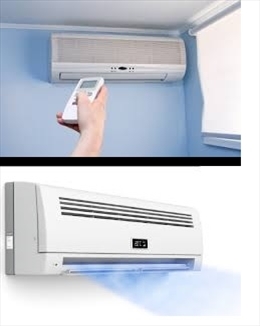 The best thing about ductless air conditioners is that it takes very little space inside the room and is also known as mini split system or ductless split system. Ductless split systems consists of two components. They are a compressor that is installed outside the house on a concrete slab. The other is the indoor unit which contains a fan, which is installed near the ceiling on an exterior wall in the area which has to be cooled. It is the copper refrigerant lines that connect both the two units through small holes that are drilled into the wall. At the same time, there is no requirement of external wiring as electricity is supplied from the outdoor unit to the indoor unit. As far as the working of the ductless split air conditioners are concerned, it works like any other air conditioner by taking heat from the inside of the house and dissipating it outside. The process is somewhat similar to the working of refrigerators. The evaporator that is located inside the house and the condenser that is located outside the house work simultaneously to transfer and dissipate heat through the refrigerant that is pumped between the two units. Ductless air conditioners are highly energy efficient means of cooling. This is because they use only minimum energy required to match the need for cooling required in a particular space. When the cooling requirement of a space increases or decreases the electrical consumption of the system also decreases. As a result of which the instances of cycling and turning on and off reduces and so wastage of electricity can also be controlled to a large extent. The variable speed of each of the components along with the elimination of duct work is also a factor that contributes to higher energy efficiency. Some of the other benefits of ductless air conditioners are that it emits low noise so even if the unit runs one will not feel the uncomfortable noise. It also has a higher level of comfort. Moreover, with the use of inverter technology, ductless air conditioners have high SEER ratings, the result of which is highly efficient systems. Last but not the least, proper maintenance of the ductless air conditioners is pertinent for its proper functioning. At least, cleaning the filters at regular intervals is an important step that homeowners should take towards the maintenance of ductless split systems.